Today I painted the rail at Davis. 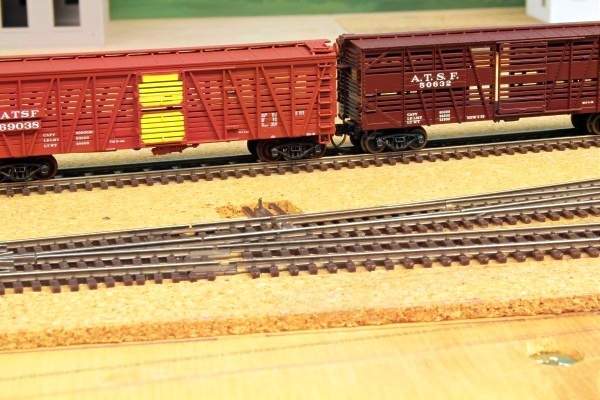 Before picking up the brush I did some research into what other modellers do to make their track look more realistic. I was tempted to try painting the ties and rail in the secondary track differently to the mainline track, to represent the fact that it received less maintenance. I finally decided that I should learn to crawl before I try walking, and left the ties alone. After considering and trying several options, I brushed Floquil Roof Brown on the sides of the rail. It didn't go on as thick as I would have liked, but seemed okay at the time. Now that I look at the photos though, I think it needs another coat. 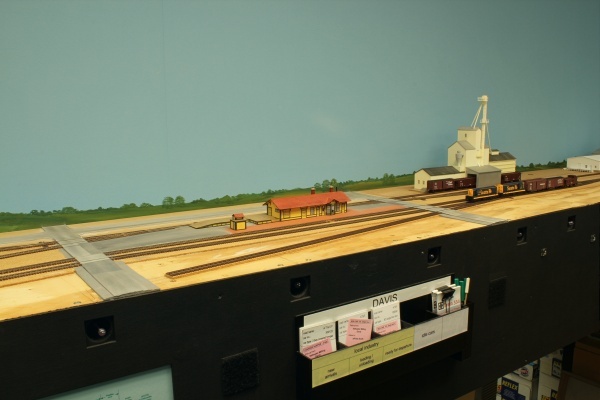 The plastic rail joiners in the photo were installed when my layout was still operating on DC/cab-control. I plan to rewire the two turnouts in this photo as I did with the ones here, and when I do that I will also replace the plastic joiners with metal ones.